A big part of learning how to read crypto charts is understanding trend lines. Drawing trend lines helps us in identifying and confirming trends. So, what is the trend line? 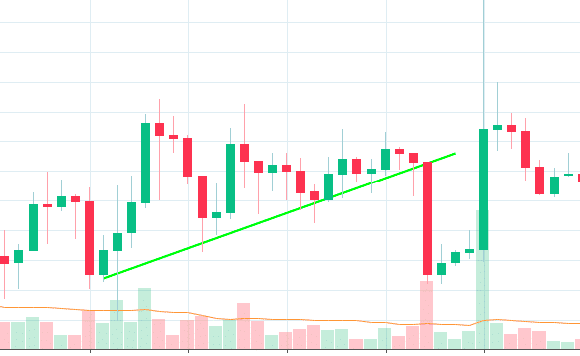 A trend line is a straight line which connects at least two price points and can extend into becoming a line of support or resistance. The trend line is created by connecting more than two of these high points. Each of these high points should be lower than the previous high point. The downward trending line acts as a resistance level and shows a declining price combined with increasing supply. As long as the price remains below the trending line, it shows a bearish trend. A break above the downtrend line indicates that a change of trend could be imminent. 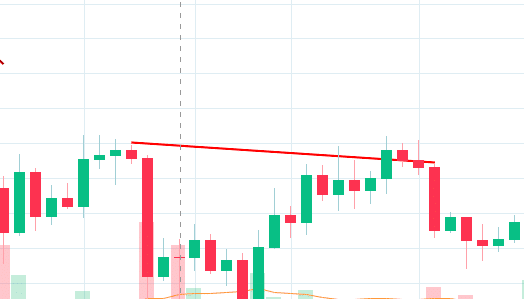 An upward trending line has a positive slope and is formed by connecting more than two points on the lower shadow of the green candles (low point). Each low point is higher than the previous low point. Upward trending line acts as support and indicates that the demand of the asset is increasing as the price rises. A rising price combined with increasing demand is very bullish and shows a strong desire on the part of the buyers. The upward trending line acts as support and the price remains above the line. However, if the price breaks through the trending line then that’s a strong bearish indicator. 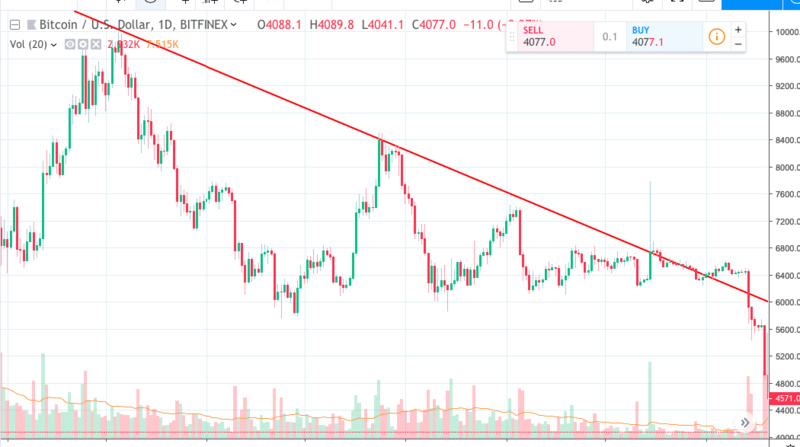 Like the BTC/USD chart before, there are two downward trending lines and three upward trending lines. The convergence of these lines can help us understand the behavior of the assets. When you draw a trending line, it must go through at least 2 points of the upper or lower shadow of the candlestick. Your tending line will be stronger if it can go through more of these points. It is not possible to draw trending line on every price chart, even through they are an important part of technical analysis. The general rule is that a trending line should go through two points and a third point should validate it. If it goes through more than three points then the trending line is considered extremely strong. The spacing of points in an uptrend or a downtrend line should not be too far apart or too close together. Having points which are too close together or too far apart can both be problematic. The problem with this is that the points are so far apart that it is impossible to know if the points have any relations to each other are or not. Ideally, we want points which are relatively well-spaced out. This makes sure that we have a trending line which is strong and true. Over here you have a trending line with a flat angle. This is again useless since you are not really gaining any functionality of a classical trending line. You are far better off drawing horizontal lines of support and resistance instead of going ahead with trending lines like these. The biggest advantage of trending lines is that it is extremely simple, cheap, and fast. Given some historical data, a trend line can be quickly drawn to make some estimates about how the price will respond in the future. The biggest disadvantage is that this isn’t the most accurate of approaches. It needs to be used in conjunction with other technical analysis tools to make a more accurate prediction. So, let’s look at some of the most important chart patterns using trending lines. This is one of the most common patterns that you will see. 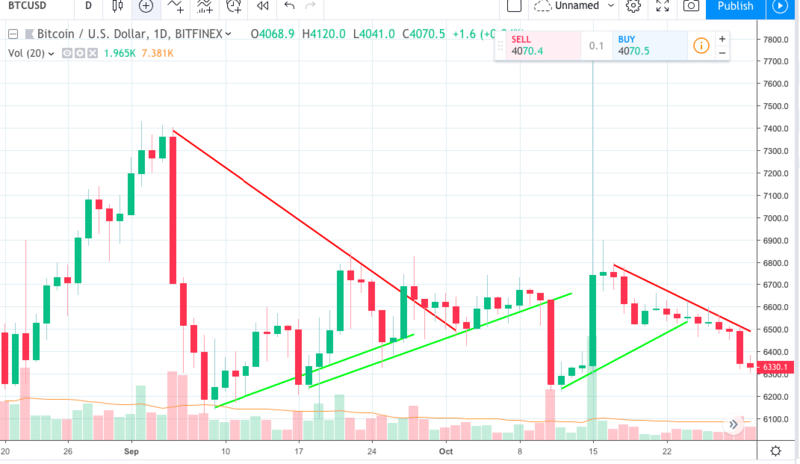 The idea is simple, there will first either be a strong bearish movement or a strong bullish movement, which is shown via a big red or a big green candlestick. 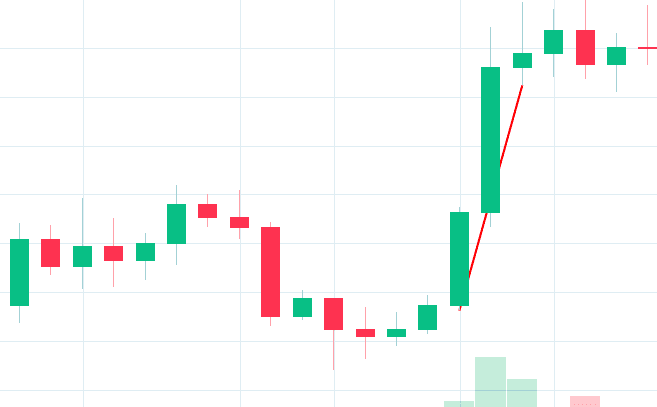 Following this movement, you will notice a period of consolidation, which is highlighted by the green rectangle above. If you feel that the market is prime for a bearish breakout then its best to sell during the consolidation period. Otherwise, if you think that the market will do a bullish breakout then buy in during the consolidation period. A descending trending line and an ascending trending line. A line of resistance/support with an ascending trending line. A line of resistance/support with a descending trending line. 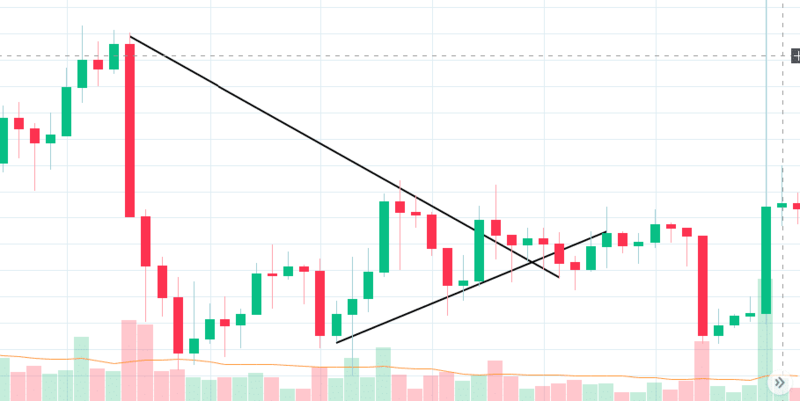 A triangle formation depicts that a bullish or a bearish breakout is imminent from the triangle. Shoulder 1: The market is going up, when it meets resistance and then goes down. This forms the first shoulder. Head: The market then meets support and goes up. 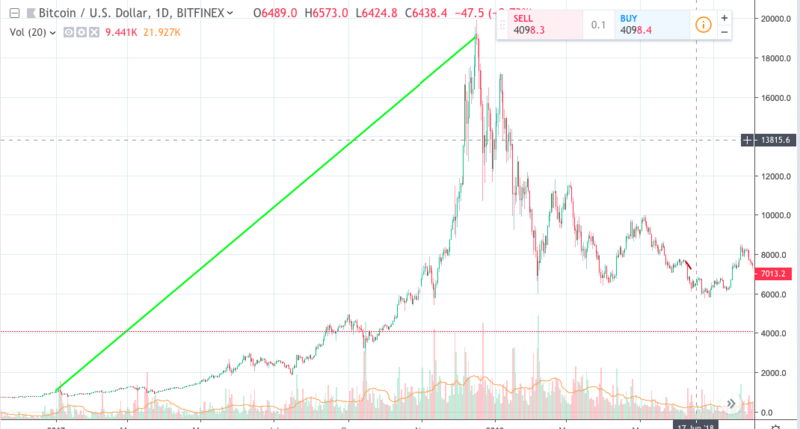 This support line is called the “neckline.” The market then goes up, beat the former resistance level and hits a peak before crashing all the way down to the neckline again as the market tries to readjust. 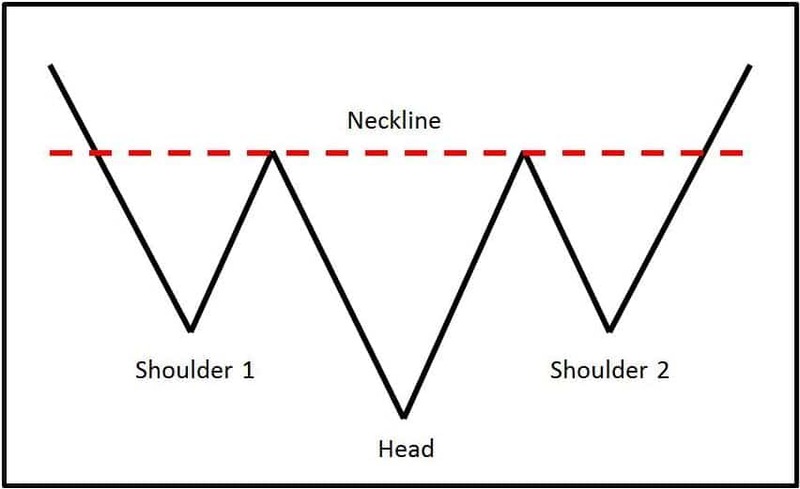 Shoulder 2: The market goes up from the neckline and meets a resistance level which is lower than the head. Shoulder 1 and shoulder 2 will not be of the same height in an ideal scenario. The market then rallies down and breaks below the neckline. Alright, so let’s see how it works in a real market scenario. 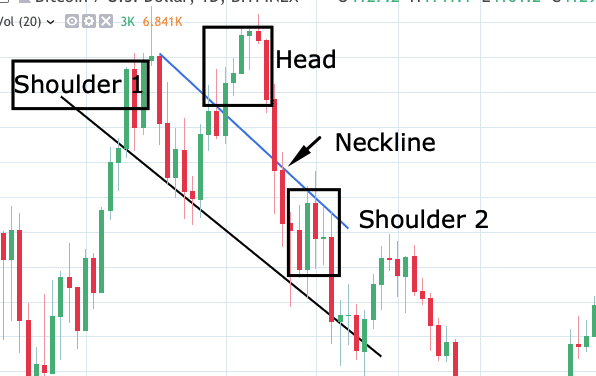 This is actually a more realistic version of how a head and shoulders pattern works. The blue downward trending line works like a neckline for this graph. The shoulder 1 reaches the neckline and meets resistance. The price then goes down all the way to the support which is the black downwards trending line. The price then bounces off the support line and then gathers enough momentum to breach past the resistance at the neckline and reaches a new high. This is the head of the pattern. The market then goes down again and goes below the neckline. The price picks up now and meets resistance at the neckline again before dropping back down. 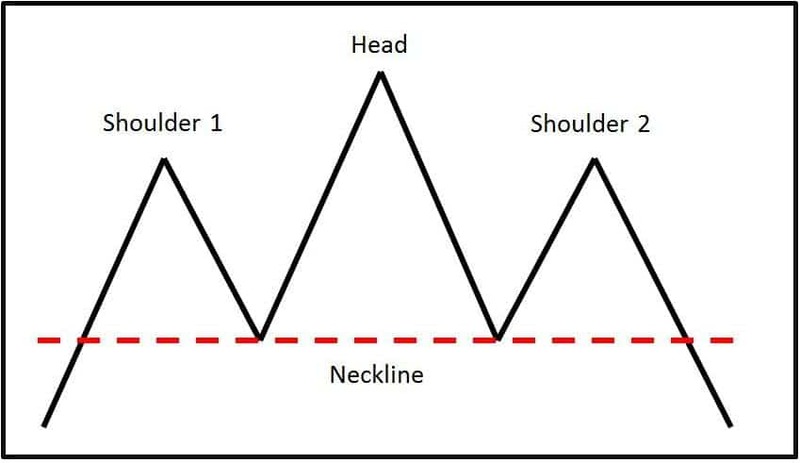 Now, let’s checkout the reverse head and shoulders pattern. The price is falling down meets support at the neckline. Upon bouncing back, the price goes up. This forms the shoulder 1. The price now meets resistance at the black trending line and then falls down. In fact, the downward momentum is so strong that it breaches past the support at the neckline and goes down even further. Now the bulls rally together, the price goes up and meets resistance at the black trending line. This forms the head. The price now falls down from the resistance line (black trending line) and goes down till the neck line. This is where it bounces up from the support and goes up again. This forms shoulder 2. 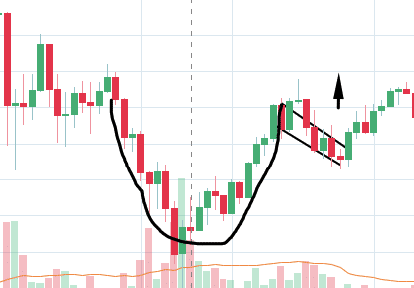 As you can see, this is called a cup and handle because of the pretty obvious pattern. So, what’s happening here? There is a price wave down, followed by a stabilizing period, followed by a rally of approximately equal size to the prior decline. It creates a U-shape or a cup. The price then moves sideways or drifts downward within a channel. It forms the handle. The handle may also take the form of a triangle. So, what is the purpose of the cup and handle pattern? 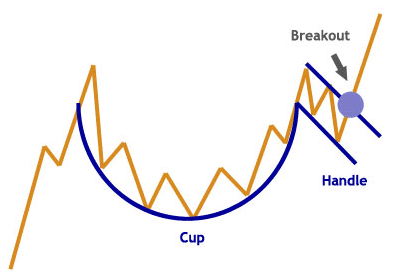 Reversal: If the price is going down, then the cup and handle pattern reverses the downtrend. Continuation: Continuation happens when the price is already going up and the cup and handle pattern occurs and continues the uptrend. The price forms a cup and then an ascending triangle which acts as a handle. From the handle, the price has a positive breakout. The price forms a cup and then a descending flag pattern which acts as a handle. From the handle, the price goes up. The next tool at your disposal is simple moving averages. So, what is a moving average? A moving average is calculated by averaging a number of past data points. Once plotted, these points will help identify the direction of the current trend. When plotted, the traders will have the ability to look at smoothed data rather than focus on disjointed, fluctuating data. So what is a simple moving average? As the name states, simple moving average (SMA) is the simplest form of a moving average. SMA is calculated by taking the arithmetic mean of a given set of values. SMA n = (A1 + A2 + A3+…+An)/n. Its 10-simple moving average is as follows: (1+5+4+2+3+7+6+8+9+9)/10 = 5.4. Now, if we want to calculate the 50-day simple moving average then we will take the average of the last 50 values of that particular asset. So, why are we calling it a moving average? 1, 5, 4, 2, 3, 7, 6, 8 , 9, 9, 11. We will plot all these points on the graph and plot the curve. The purple curve is the SMA 20 of this curve. If the SMA is moving up, the trend is up. If the SMA is moving down, the trend is down. SMAs are extremely helpful to determine the direction of the trend. SMA 200 is commonly used to find long term trend, SMA 50 is used to find intermediate trend, and many traders use SMA 20 to find short term trend. The longer the time period, smoother the price data and technical indicators. However, this results in more lag between the SMA and the source. When a price crosses over the SMA curve, it is a bullish sign. When the SMA curve crosses over the price, it is a bearish sign. SMA Crossing SMA is another common trading signal. When a short period SMA crosses above a long period SMA, it is a bullish sign. When a long period SMA crosses above a short period SMA, it is a bearish sign. This is mainly because a short period SMA crossing over long period SMA shows that a short-term trend is taking over a long-term trend. One of the most powerful indicators is the crossing of SMA 200 and SMA 50 curves. The BTC/USD daily chart above uses SMA 20, SMA 50, and SMA 200. 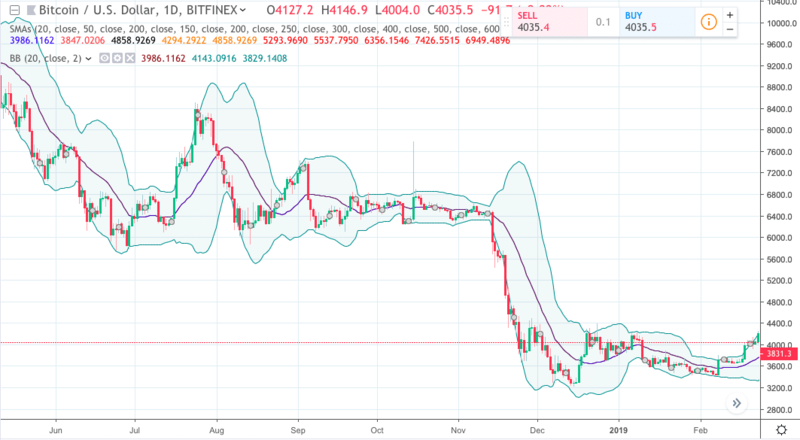 In the chart below, we have used the 20-day Bollinger band on the BTC/USD daily chart. The simple moving average of the time period that you chose. This is the middle curve in the band above. The positive standard deviation which is the upper curve. The negative standard deviation which is the lower curve. So, how do we calculate this? You already know how to create a simple moving average curve. Now, let’s look into standard deviation. Standard deviation is a mathematical measurement of average variance and features prominently in statistics, economics, accounting and finance. A standard deviation calculates how much the current value of an asset deviates away from its average value. How can Bollinger bands help you with trading? When the bands come close together, constricting the moving average, it is called a squeeze or narrowing of the band. This signifies that the market is losing its volatility. When the bands go further apart or widens, it shows that the market is increasing its volatility. The widening and narrowing of the band will give you a great indication as to whether a price is going to change or not. The price goes up and the market becomes so bullish that it breaches past the upper curve of the bollinger band. This is a strongly bullish sign. Ideally, we want our asset to be above the SMA curve. If it breaches the upper band then that means that the market is extremely bullish. Within the green square there are a couple of red candlesticks as well. These candlesticks are bearish in the nature but they are still trending above or near the upper curve. Over here, the bears have taken over the market and the price plummets till it breaches the lower band. There is a green candlestick as well however, it is touching the lower band. This means that even though the session was bullish, the overall sentiment remains bearish. This pretty the same as the green square. The market has been taken over by the buyers and now the price has breached the upper band before re-adjusting. The moving average convergence divergence (MACD) is a momentum indicator which is extremely useful in letting us know whether an asset has bullish or bearish momentum. It shows the relationship between two exponential moving averages of an asset’s price. NOTE: An exponential moving average (EMA) is a kind of moving average like the simple moving average. 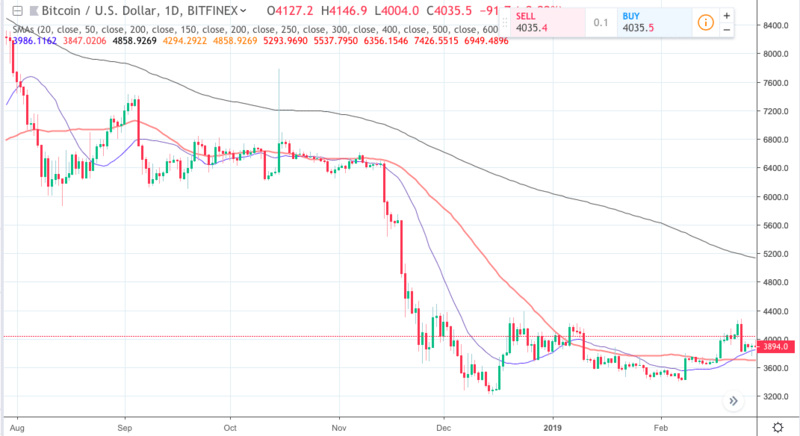 An exponentially weighted moving average reacts more significantly to recent price changes than a simple moving average (SMA), which applies an equal weight to all observations in the period. The blue curve which is the 9-day exponential moving average (EMA 9). This is also called the signal line. The MACD curve which is the orange curve. The histogram, which is the difference in values between the EMA 9 and MACD. The conventional MACD is calculated by subtracting the EMA 26 from the EMA 12. The Formula for MACD is: MACD = EMA 12 – EMA 26. When the signal line crosses over the MACD, it is a buy signal. When MACD crosses over the singal line, it is a sell signal. The more the distance between the two EMAs, the bigger the size of the histogram. The size of the histogram helps us understand how strong the bearish or bullish momentum is. If the speed of the crossovers is fast, then it is understood to be overbought or oversold. When the MACD falls below the signal line, it is a bearish signal which indicates that it may be time to sell. Similarly, when the MACD rises above the signal line, the indicator gives a bullish signal, which suggests that the price of the asset is likely to experience upward momentum. In the graph above, you see histograms of differing sizes. A large histogram shows that the momentum is heavy either on the bearish side (red histograms) or on the bullish side (green histograms). So we have a rapid descent, followed by a rapid ascent, a rapid descent and then a long period of sustained ascent. This tells us that the bears and bulls have been trading shots until finally, the bulls were able to end up on top. So, in part 1 and part 2, we have learnt several different kinds of indicators. Let’s bring everything together and read the latest BTC/USD daily chart through technical analysis. Let’s look at what we have here. 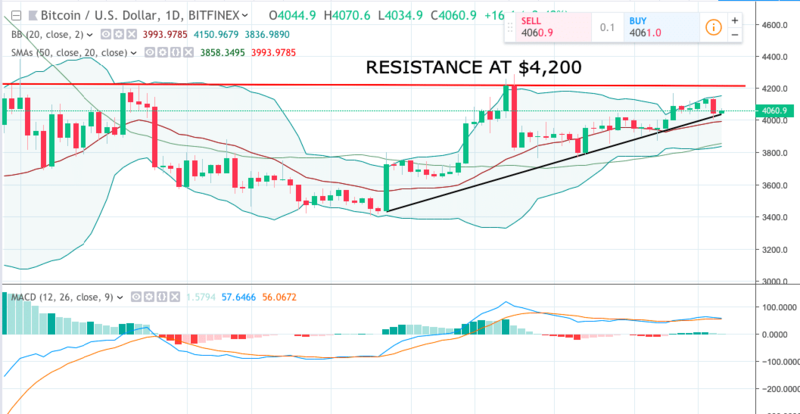 The market currently has resistance at $4,200. 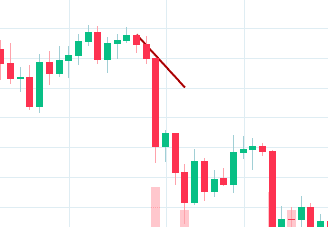 The second last session was extremely bearish in nature and the price went down until it found support at the upward trending line (black line). When you check the MACD indicator, the signal line is about to crossover and go below the MACD curve which means that further downtrend may be expected. 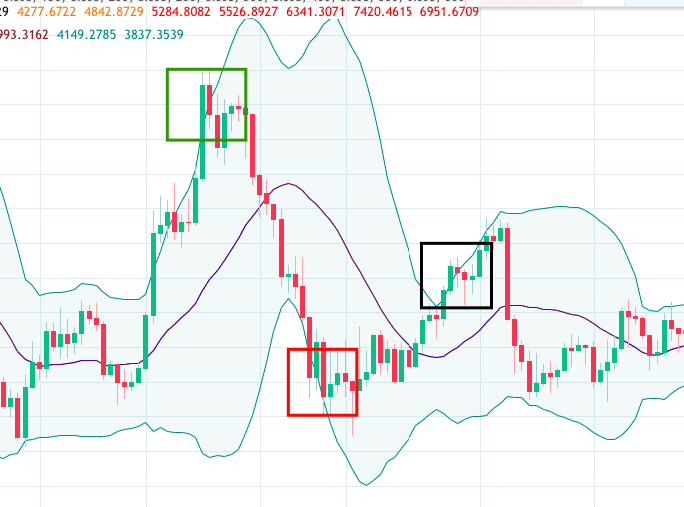 The market is still trending above both the SMA 50 and SMA 20 curves which are both bullish indicators and is one the upper half of the Bollinger band. 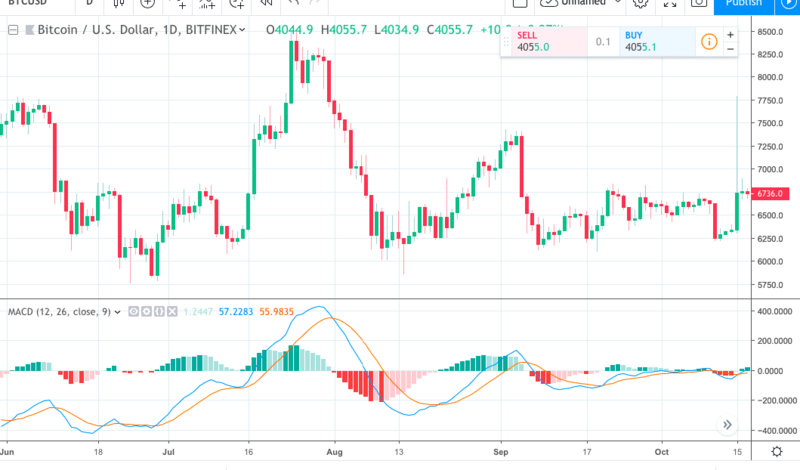 The BTC/USD daily chart is currently experiencing bullish sentiment. However, the MACD indicator shows us that bearish dominance may be around the horizon. Over the last two parts, we have shown you how different technical analysis tools work. Remember one thing, most of these indicators are not that accurate when used in isolation. You will need to use all these in conjunction with each to get a more accurate result. 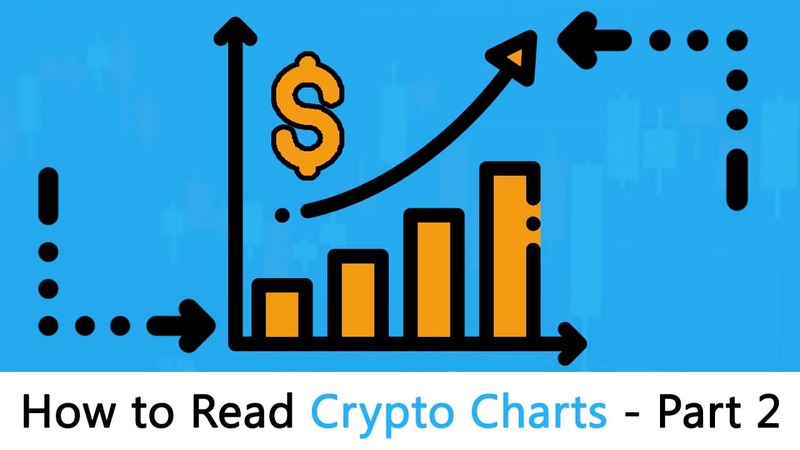 Hopefully, this guide has helped you learn how to read crypto charts!